This very interesting surname is English, but of Norman French pre 10th century origins, being introduced at the Conquest of 1066. It is derived from the Norman personal name "Hamon", itself a variant of the early Germanic word "haim", meaning home. It is claimed that the surname was formerly most associated with the region known as the West Country, and certainly the first recording is probably that of Richard Hamlyn, at the village of Larkbeare, in the county of Devon in 1219. Other examples of the early recordings taken from surviving rolls and charters for the medieval period include: Thomas Hamelin, in the charter known as the "Liver memorandorum ecclesie de Bernewelle" for the county of Cambridgeshire in the year 1230, and Osbert Hamelyn in the Parliamentary Writs of the year 1306. Robertus Hamelyn is recorded in the Poll Tax Rolls of Yorkshire in 1379, whilst Thomas Hamblyn appears in the Hearth Tax rolls of Suffolk in 1568. 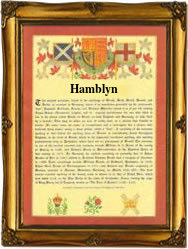 The surname is recorded in a wide variety of spellings which include: Hamlin, Hamlen, Hamblyn, Hamlyn, Hamlen, and Hambling. Recordings from church registers include the marriage of Marie Hambline and William Prestwood at St. Mildred's Colechurch, in the ancient city of London, on January 31st 1599, and the christening of Hannah, the daughter of John and Mary Hamblin, on December 9th 1683, at St. Dunstan's in the East, Stepney. Throughout the centuries, surnames in every country have continued to "develop," often leading to astonishing variants of the original spelling.